Bring the water or stock to a boil and add vegetables. Reduce heat and simmer until vegetables are tender (15 minutes or so). Drain the vegetables, reserving the cooking liquid. Heat the ghee on a low heat and add korma powder and stir until fragrant (3 minutes) Add the almonds and leek and cook for 3 more minutes, stirring. Stir in the flour and asafoetida and cook for 2 more minutes. Pour in the reserved cooking liquid, chopped dates and coconut milk. Whisk until smooth and simmer for 2 minutes. Stir in the coriander and season to taste. Add the vegetables, stir to coat with sauce and serve with rice and chappatis. You can also add 1-2 tablespoons of cashew nut butter, stirring thoroughly until blended. Put the following in an electric blender (or grind separately in a mortar. Store in a jam jar and use within 6 weeks, or use half the amounts of spices to ensure freshness. 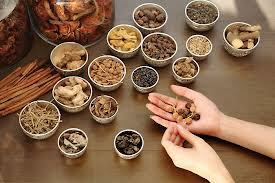 I have included the Ayurvedic therapeutic effects of each of the spices to illustrate that food is medicine.